Despite the painfully slow processing of the papers for the atelier, the House of Tammam continues to prosper. One exciting aspect for us is the world of actors and actresses. That glamorous group of talented teasers, who make a living pretending to be someone else. Fortunately for us, they also spend a lot of time at seductive shoots and swanky soires sipping champers and looking beautiful. That’s where Tammam comes in. By far the most handsome thespian to wear our tresses is the magical Colin Morgan. Yes, despite Tammam being a woman’s wear brand I convinced the dazzling star to don a silk scarf during a shoot for The Lady magazine. And didn’t it work well. In fact, meeting the eco aware, vegetarian, and dashingly gorgeous Colin inspired me to add a couple of menswear pieces to the Lucina Puro accessories collection. Scarves and ties will be available later in the year, with a bespoke suit service on a very limited basis when the atelier opens. 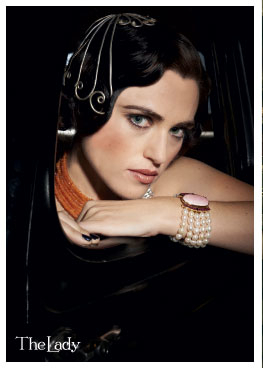 At the same shoot was the utterly enchanting Katie McGrath. One of my favourite pictures from the shoot is this one, where she models our Sapphire silver head piece. 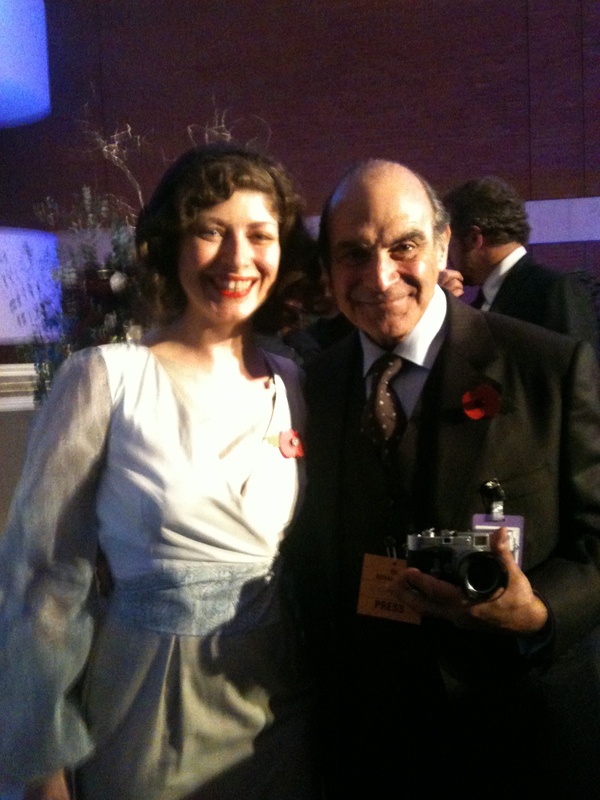 During London fashion week a few seasons ago I bumped into one of my favourite beauties. The towering Erin O’connor looked down at me and my heart skipped a beat. By far one of the most stunning people I have ever seen in the flesh I was delighted when she accepted a broach from the accessories collection. She even tweeted us “@HouseOfTammam thank you for that beautiful broach :)” Smiley face indeed! Rachel McDowel was a stunning mannequin for our gold lace cami dress, available exclusively from Ethical Hedonist. The gorgeous and hugely talented starlet Olivia Williams has also been spotted in Tammam, I love this image. 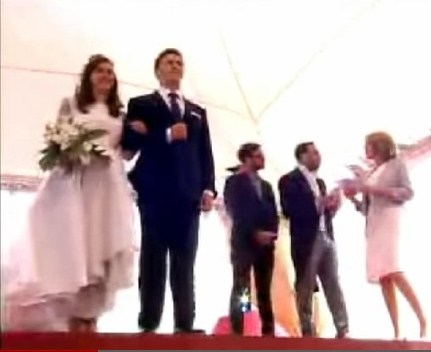 The day before the Royal Wedding last year our eco “Kate” gown was featured on This Morning. Dancing legend Jason Gardiner called it “Absolutely gorgeous” and here we are, on the box! Perhaps we’ll even get the Duchess herself to wear some eco-couture to one of her dos this year…. Recently I had the pleasure to dress an incredible rising star, Eleanor Tomlinson. With her captivating personality and faultless determination this young lady is sure to be gracing cinema screens and red carpets for many years. Eleanor can be seen wearing our fabulous Banana gown in the next edition of the Lady Magazine. We might be in talks about a few red carpet gowns too. I have a feeling this girl will be our new eco champion. The fresh blood, and beauty, ethical fashion needs right now. Watch this space. Last year we were asked to create a eco, vegan wedding gown for screen icon Alicia Silverstone for one of her upcoming films. What a challenge! We had roughly 2 weeks (fantastic planning, wardrobe department) to design, approve and make a dress that would fit her post baby bosom, the film and Alicia’s ethical values. Thankfully she loved the dress. Unfortunately I’m not allowed to post any pictures. However we received the dress back and it will be available for hire from the Atelier this summer.